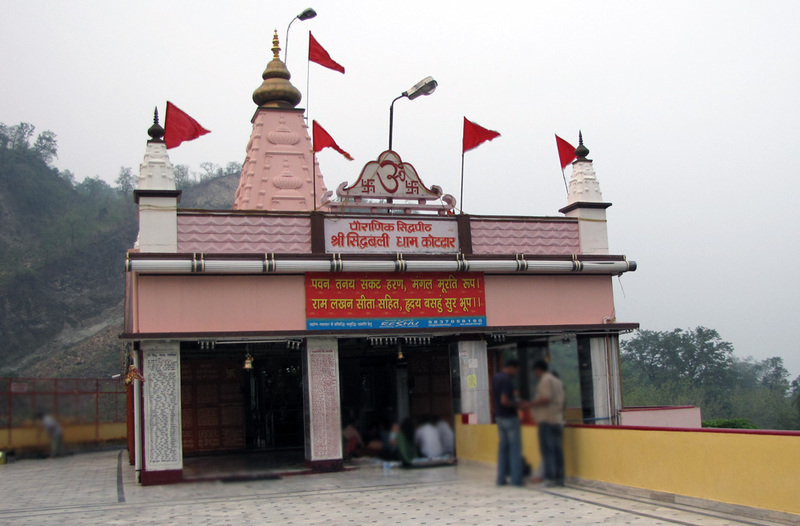 Kotdwara (Kotdwar) is located at the foothills of the Shivaliks at a distance of 101 kms from Pauri. It is entrance to hills in Puari reigion of Uttarakhand, and literally means 'Gateway to Garhwal'. Kotdwar is famous for its several temples like the Siddhbali temple which is located at a distance of 2kms from Kotdwar. The Durga Devi temple is also located at a distance of 2kms from Kotdwar and is one of the most popular temples of the region. Kotdwar is well connected by rail network to places like Lucknow, Delhi and Howrah. It also has an excellent road network. You can buy handicrafts and souvenirs from Malni market, and District Board Shopping Centre. Kotdwar is the entrance point of famous hill station Lansdowne as well. Shopping: Being an industrial and commercial hub, there are shops and markets at Kotdwara where one can purchase handicrafts, souvenirs, religious idols and other artifacts. Malni market and District Board Shopping Centre are famous markets in Kotdwara. Temple Visit: Kotdwara is home to revered temples and shrines that are visited by large number of devotees. Siddhabali temple, Durga Devi temple and Koteshwar Mahadev are some of the revered temples at Kotdwara. As Kotdwara is an industrial and commercial hub, facilities like ATMs, departmental shops, petrol pumps, and eateries are easily available. Known as the ‘Gateway to Garhwal’ region, Kotdwara is located at the foothills of Shivalik hills of Garhwal Himalayas. Due to its importance as being a commercial town, plenty of accommodations have mushroomed in the city. There are semi-deluxe as well as budget hotel and guesthouses with limited amenities at Kotdwara. However, finding a luxury accommodation could be little difficult. There are abundant road side dhabas and local restaurants at Kotdwar where one can find North Indian cuisines and popular Chinese dishes at affordable prices. Being a small town, it is hard to find good restaurants that serve delectable choices of cuisines. Tourists travelling to Kotdwara must taste the iconic Bal-mithai and Singauri that is available at every sweet shop. Kotdwara remained isolated for many years and was known as the lesser known place of Uttarakhand. Later it came into the eyes of the people when Kotdwara was connected by rails to the major parts of Uttarakhand. Not many people know that Kotdwara Railway Station, established by the British in 1890 is among the oldest railway stations in India. This rail-head was used for transporting timber from the Himalayan region. After this, an industrial revolution was seen in Kotdwara as many big and small scale industries were established in Kotdwara. What is Kotdwar famous for? Kotdwar is famous among tourist as Business hub. Kotdwar is popular destination for following activities/ interests - Business Hub, Others. Travelling to Kotdwar in 2019? Contact us for planning your Kotdwar tour with best travel packages of as per your requirements! eUttaranchal is promoting Travel and Tourism of Uttarakhand since 2003. Our motto is "Marketing Uttarakhand Worldwide." eUttaranchal.com is NOT an Official website of Government of Uttarakhand (Uttaranchal) neither is it associated with Uttarakhand Tourism Board or KMVN or GMVN. Besides Uttarakhand Matrimonial and Uttarakhand Tourism services, eUttaranchal is also a mini encyclopedia of Uttarakhand providing information about Culture, Tourism, Education, Politics and News about Uttarakhand. Send us your travel details and we will help you with making best travel itinerary at the best offer price!